Last week I found out a community friend came to work for VMware and we started having a discussion about how to be successful working from home 100% of the time. I also had been interviewing some candidates where the topic came up so someone suggested I write down some thoughts and ideas on the subject. As I though about it I realized I have been doing the work from home thing for over 8 years now. So although not an authority on the topic I think I have some pretty good insights. That being said….let me know what you think. Work From Home Rule #1 – Make Space! When I started working from home the FIRST thing I did was carve out an office space. This may seem obvious, but I have also seen people work from the kitchen table on a daily basis for many months or years. You NEED a private dedicated space for any one of a thousand reasons. Conference calls, a place to focus, close the door from distractions, you name it. At the end of the day you get the best office in town….the one you build for yourself. I used to joke that I had a “corner office” because the converted bedroom was a corner room with two windows. My point….you need a place to work away from the distractions. The first thing you will figure out working as a 100% remote employee is that you work MUCH longer hours than most people. Those folks that go to the office pretty much try to get there “just on time” and also leave “at the closing bell”. It’s because you don’t want to really be stuck in the office in your cubicle. At home….it’s a nice place. You love it at home, so you never really hate it. That means you will probably log in at 06:00 and actually NEVER log out. The upside is you control your day but you have to be very conscious of it. As an example I actually block out lunch and work out times in the morning. This way I’m shown as not available when people check my outlook. This is important to me because I need to spend some time doing normal things…..like EAT. If you are not good at planning your day……you’re screwed and you better get some help with it. This is a huge deal! In the office you get up, go see people, chat, but what you forget is that you are MOVING. I wear a Fitbit that reminds me to move every hour because frankly you will get involved and you will forget there. Sitting still is the new smoking…..it will kill you and it will kill you fast. You’ve got to take breaks, drink water and simply get up off your arse and move around. I struggle with this a lot. I used to have a pull up bar in the door of my old office and I need to do that again. Even just doing some push ups, pull ups, or stretching on a stability ball helps. Your body is not meant to sit still for hours at a time. Work From Home Rule #4 – Pick up the Phone! Human interaction pretty much disappears when you work from home. All your communication ends up being done in email, Skype, or some other chat program. That’s all well and good, but nothing replaces a good old conversation. You just need to make a conscious effort to TALK to people. You will end up on an island and people will not even know you exist. IN many roles you need to work on teams that are spread out and communication is key. If you don’t talk to people you will end up talking to yourself, or the dog, and that’s never going to end well. I’m lucky that my wife works from home too, but we are the only two people who are here so we still need to make an effort to talk to other humans. Wait…..what? Aren’t I supposed to be working? Well yes you are. You have to get your work done, but in the spirit of having a work life balance you can get out of the house for a bit. You can go out and grab lunch, you can run an errand. You actually need to couple this with the get up and move part. You just have a little more flexibility to do so. You cannot abuse it, but you can and you must make some time to just get out of the house. There has been weeks when I don’t leave the house except on Saturday and Sunday because I was so busy. I love my house…..but not that much! Like everything there is advantages and disadvantages, but you need to understand both sides of the story. Note some things are both a pro and a con. By all means I’d love more people to add to this list for sure. I have another rule: get dressed. You never know when you will need to do a video chat. It also helps me get into “time to go to work” frame of mind. Another major factor is to create “work rules” with the family. I have my work space, but it is the same space as our home printer and filing area. My daughter comes home between 3:45 and 5pm, depending on the day. She needs to follow the “work rules” about not interrupting. This could be especially bad if I’m in a customer meeting. My wife may need to print, or get something from the filing cabinet. She also needs to understand the “work rules”. 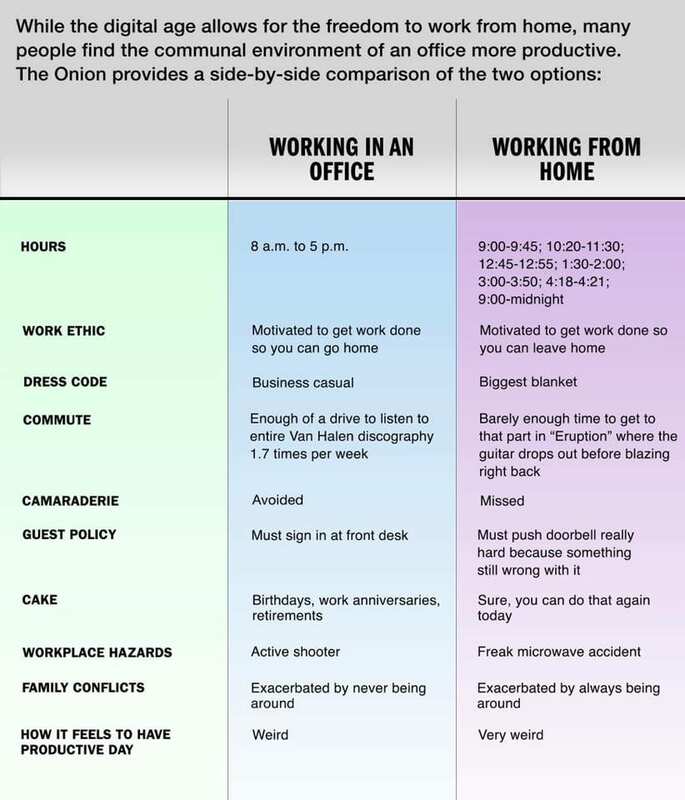 I think the toughest situation would be to be a 100% WFH and a stay at home spouse. Unless that work space is completely isolated, it could become tough. Welcome to my world! 100% WFH and a WFH wife with her embroidery business and two machines going every day :). We have those in a separate room with sound absorbing drywall but our office is 100% shared. Great article, Chris. I think TheOatmeal has a cartoon version of this. Thanks for the words of advise as someone who is joining the work from home crowd in the next two weeks I needed it. I like to think that patterns still apply showers and dressing is important.